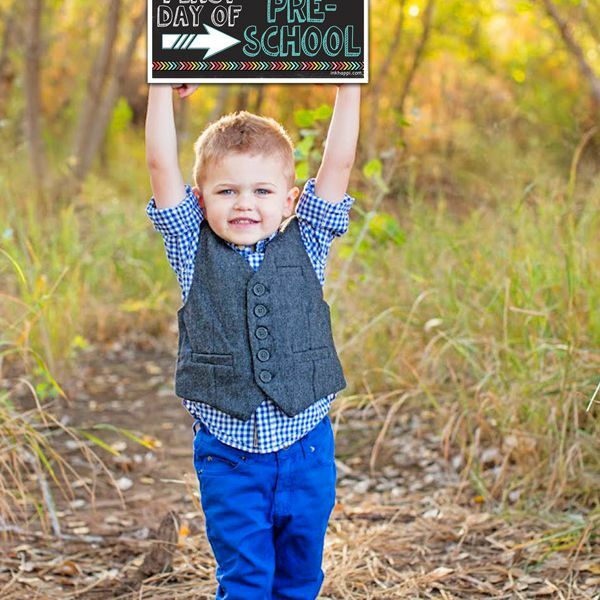 The first day of school is a special one, and these first day of school signs are excellent photo props to help you mark the occasion. You'll want to simply print off the first day of school sign for the grade your child is entering on either plain paper or cardstock. Have the child hold the sign, give you a smile, and then you can take the picture. Not only are these signs adorable, years from now you'll be able to instantly see when it was taken without having to struggle to find the date or make a guess on their age. 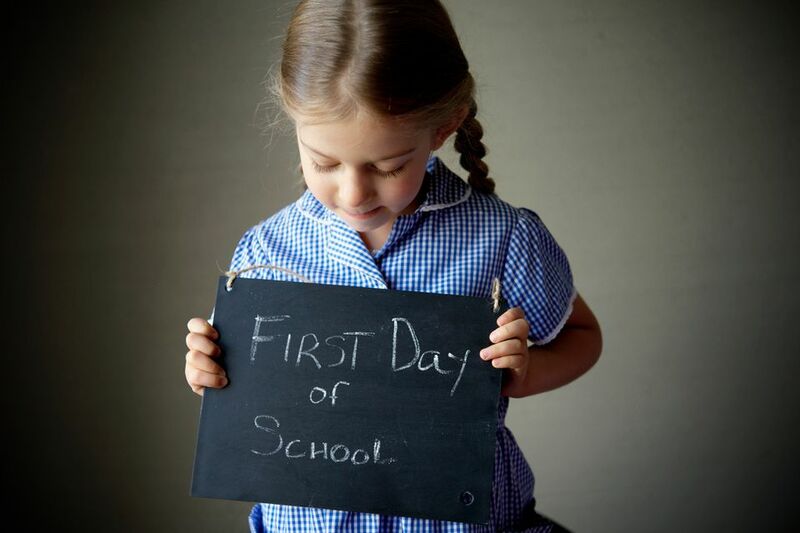 You will have an instant keepsake for the special first day of school that you can cherish for years to come. Tip: These signs can be framed, taped to a popsicle stick, or just held by the child for the photo. These first-day-of-school signs by Inkhappi say "Back to School" at the top and then have room to let everyone know what grade your child is entering. These signs start at preschool and go all the way up to 12th grade. The blue and white text is on a black background with rainbow flags and arrows making this a great choice for a boy or girl of any age. These colorful first-day-of-school printable signs by Savings Lifestyle certain stand out of from the crowd with their white backgrounds and yellow, orange, and blue flags and text. You can print off these first-day-of-school signs beginning at pre-school going all the way up to the first day of college. These cleverly designed first-day-of-school signs from Jones Creek Creations, look just like little chalkboards. There are signs for Pre-School all the way up to college including a few additional options for Kindergarten and preschool. These colorful back to school printable signs from I Heart Naptime might just be my favorite out of the whole bunch. They come in red, yellow, green, and blue and all the grades are a little bit different from each other. The first day of school signs are available from preschool up to twelfth grade and can quickly be printed from your home computer. Lolson Designs has created these cute first-day-of-school signs that have a black and gray chevron background with an apple on them. They even have room for you or your child to write their name and put the date. These back to school signs are available to download as PDF's for each grade starting at preschool going up to twelfth grade. You'll love these first-day-of-school signs from Modern Parents Messy Kids because they have room for your child to write down what they want to be when they grow up. What a beautiful addition to an already special day. You can choose to print these first-day-of-school signs in either color or black and white. They're available for all grade levels starting at preschool going up to a senior in high school. The Frog Prince Paperie has designed these lovely first-day-of-school signs with a white background, a black and white chevron border, and a red apple. These free first day of school printables can be printed for preschool up to the first day of college. These first-day-of-school signs from I Should be Mopping the Floor certainly stand out from the crowd with their colorful text and fun design. Each of these back to school signs can be downloaded and printed individually. They start at preschool and pre-k and go all the way to twelfth grade. Here's another set of back to school printable designs and these ones are decorated with illustrated drawings of school supplies. The printable signs are available for preschool through college and there are even some blank signs if you'd like to use them for something else.